African American males experience high levels of violence-related trauma. They lead all racial groups in fatal and nonfatal violence-related injury. Their responses to trauma may be mediated by personal experiences and/or ecological exposures to prejudice or inequality. Caring for these men encompasses some unique challenges, for example, they may have less overall access to mental health care, may be less likely to seek such resources, and may have lower retention rates in treatment. For this reason, they may present more commonly in general medical/primary care settings, often with physical complaints. Trauma-informed care offers a hopeful approach to caring for African American men and could address disparities in mental health treatment through robust individual provider-patient relationships and health system adaptations that are comprehensive, culturally sensitive, and work to understand institutional relationships with the surrounding community. Interventions that are culturally sensitive and multimodal are the most effective. 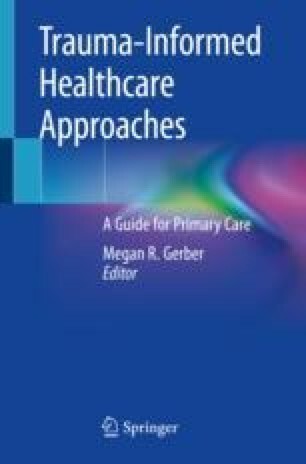 As the existing literature tends to focus on pediatric and youth settings, this chapter will provide perspective on treating adults. Black MC, Basile KC, Breiding MJ, Smith SG, Walters ML, Merrick MT, Chen J, Stevens MR. The National Intimate Partner and Sexual Violence Survey (NISVS): 2010 Summary Report. Atlanta, GA: National Center for Injury Prevention and Control, Centers for Disease Control and Prevention; 2011. Accessed 29 April 2018. Available at https://www.cdc.gov/ViolencePrevention/pdf/NISVS_Report2010-a.pdf. Centers for Disease Control and Prevention. WISQARS™ (Web-based Injury Statistics Query and Reporting System) Atlanta, GA updated 2017. Accessed 3 May 2018. Available from: https://www.cdc.gov/injury/wisqars/index.html. Centers for Disease Control and Prevention. Web based Injury Statistics Query and Reporting System (WISQARS)[online]. National Center for Injury Prevention and Control, Centers for Disease Control and prevention. Accessed 2018 May 10. Available from: https://www.cdc.gov/injury/wisqars. The Belmont Report: Ethical Principles and Guidelines for the Protection of Human Subjects of Research. National Commission for the Protection of Human Subjects of Biomedical and Behavioral Research, US Department of Health and Human Services.1979. Accessed 2 March 2019. Available from: https://www.hhs.gov/ohrp/regulations-and-policy/belmont-report/read-the-belmont-report/index.html. Powell W. How masculinity can hurt mental health [Internet]. Washington, DC: American Psychological Association (APA); 2016. Accessed 31 March 2019. Available from: https://www.apa.org/research/action/speaking-of-psychology/men-boys-health-disparities.